If you’re worried about the security of your network or your employees’ passwords, contact DigiVie to learn more about our enterprise-grade firewalls, multi-factor authentication and password management. Our firewalls are designed to secure your network while multi-factor authentication reduces the risks of remote access to corporate systems and data. Do you want to enhance security for your business? At DigiVie, we understand the importance of securing your network against hostile outside intrusions. Our installed and managed firewalls provide enterprise level security to protect your network at all times. Looking to Prevent Unauthorized Access to Your Confidential Data? Our Managed Firewalls and User Authentication Solutions Make it Simple to Protect Your Information! 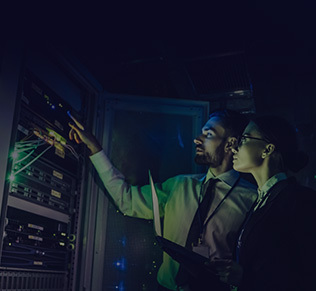 Our team of IT professionals can implement and configure your firewall based on your unique needs, in order to prevent intrusions and protect your confidential data from unauthorized access and to protect your users from inadvertently infecting your network through content and spyware filtering. Intrusion Prevention Services (IPS) and Deep-Packet Inspection (DPI) analyzes your Internet traffic in real-time providing the best possible protection in the ever-evolving world of Internet security. You Need to Protect Your Most Important Data. While cybercriminals are becoming more sophisticated each day, businesses continue to use passwords to protect their most important data. But here’s an important tip: passwords aren’t enough to protect your business against cybercriminals! In fact, passwords can be stolen, shared, guessed, cracked, and are hard to manage. With AuthAnvil multi-factor authentication in place to assure identity of your users, you significantly reduce the risks of remote access to your corporate systems and data. Ultimately, multi-factor authentication verifies the identity of users while ensuring they’re authorized to access your systems and information. Something they know (their username and password). Something they have (a code from a physical token or smartphone). Something they are (a fingerprint, iris scan, etc). AuthAnvil utilizes the first 2 of these (something you know, and something you have) with a key fob to go on your key ring, or a ‘soft-token’ that installs on your smartphone. If you want to keep remote access points secure, such as those from Terminal Services, Outlook Web Access, Remote Web Workplace, VPN, and even SharePoint; AuthAnvil multi-factor authentication is the best choice for your business. And it’s available for an affordable price! Contact DigiVie to learn more about the benefits of enterprise grade firewalls and two-factor authentication. Give us a call at (613) 277-2312 or send us an email at info@digivie.com.